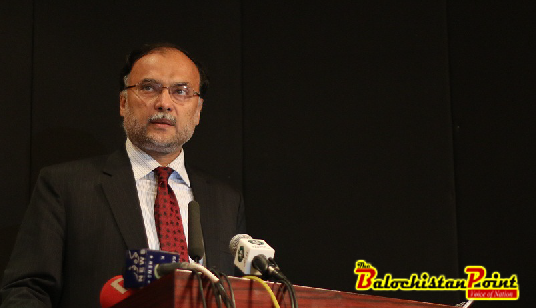 Islamabad: Federal Minister for Planning, Development and Reforms, Ahsan Iqbal Thursday said that China-Pakistan Economic Corridor (CPEC) was opening new doors of opportunities for the people of Balochistan. According to a press release issued here, he said, all suspicions about the Western route have been proven wrong and mentioned that the first trade convoy carrying Chinese goods for export to the Middle East and Africa through this route. The CPEC was considered a game-changer for Pakistan as it would create opportunities for progress and prosperity in the region, especially for Balochistan, he said. The CEPC would make Gwadar a hub of trade activities and help eliminate poverty from this less developed area by creating many new jobs for the local people, he added. He said, through CPEC Pakistan will be able to attract the kind of investment it could not attract in the past. He added that Chinese leadership has made it clear that they wanted to strengthen Pakistan’s industry through the CPEC initiative. In last 67 years, the country managed to produce only 17,000 MW energy while in only three years, we have been able to add 11,000 MW electricity in the national grid”. He opined that the economic take off has changed the perception of the world about Pakistan, adding, the current government’s economic agenda will play a pivotal role in making Pakistan and economic super power. He mentioned that the world is witnessing a transformation and it is imperative that countries prepare for this transformation.